Every once in a while, someone tells you that your business needs to be on Facebook. Or Twitter. Or Pinterest, Foursquare, Instagram, or any of a thousand different sites. It’s hard to see any short term benefits, and the format can feel really unnatural for self promotion, which is why you’ll find millions of abandoned business accounts across platforms great and small. Like Walmart on Facebook? They like you more. Not too long ago, Mashable did an awesome post on how much Facebook fans are worth to some of the biggest companies in the U.S. Based on the premise that a company’s Facebook fan is likely to shop more, buy bigger, and advocate more than a non fan, the study found that your average Coca-Cola Facebook fan is worth $70.16, while your average McDonalds fan is valued at more than twice that, at $182.98. BMW tops the charts at a whopping $1,613.11 per fan, but Walmart pulls in at a respectable 2nd place, at $834.76. Since Walmart has more than double BMW’s fan count, it actually adds up to be a little more. How Much Are All of Walmart’s Facebook Fans Worth? Take Walmart’s estimated $834.76 per fan, times their 29,566,215 fans, and that gives you a staggering $24,680,693,633.40. To put that in human terms, that’s $11,218 per Walmart employee, or enough to build Miami’s Marlins Park – almost 40 times over. 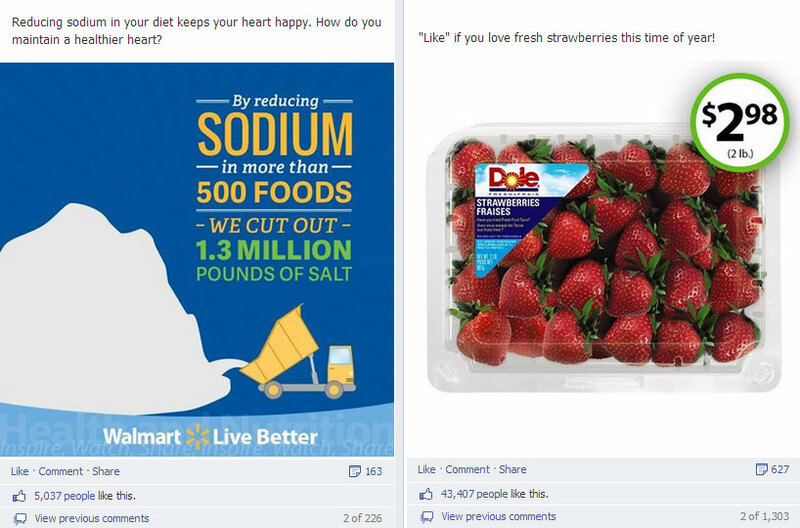 What is Walmart Posting For Their Fans, and What Can We Learn From It? How Does Walmart Cash Out? Even without a big blinking “BUY ME!” button, you can bet that someone out there threw an extra bag of marshmallows in their cart, thanks to Mr. S’More face. Maybe the idea was so compelling that they made an unplanned trip to Walmart (where they also bought six pairs of socks, two flashlights, and Airplane! on Blu-ray). Maybe someone just liked the picture itself, thereby sharing it to their friends on their wall, and brought in a few new fans for Walmart that way. Maybe Walmart earned no new fans from this, and no new sales, but succeeded in making their company look a lot more friendly and, ultimately, human. Maybe all it really did was communicate that they’re in touch with American values and a common shared experience, to make you feel better about shopping there. 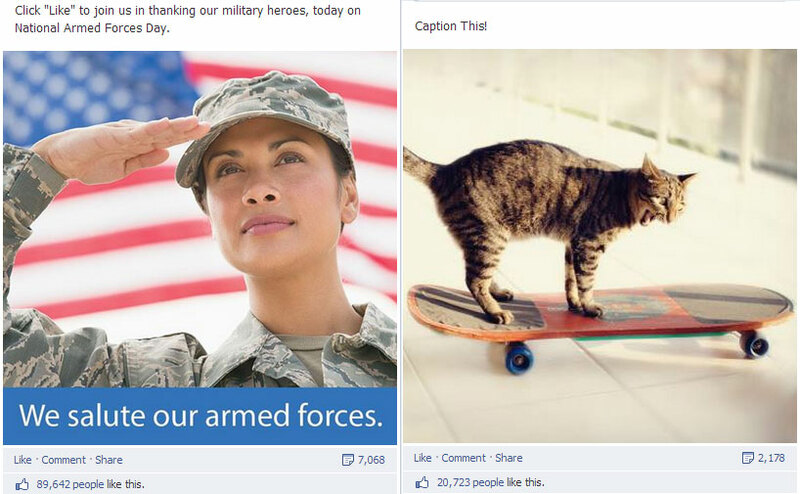 That must mean that pictures of American flags and puppy dogs would get about a billion likes, right? 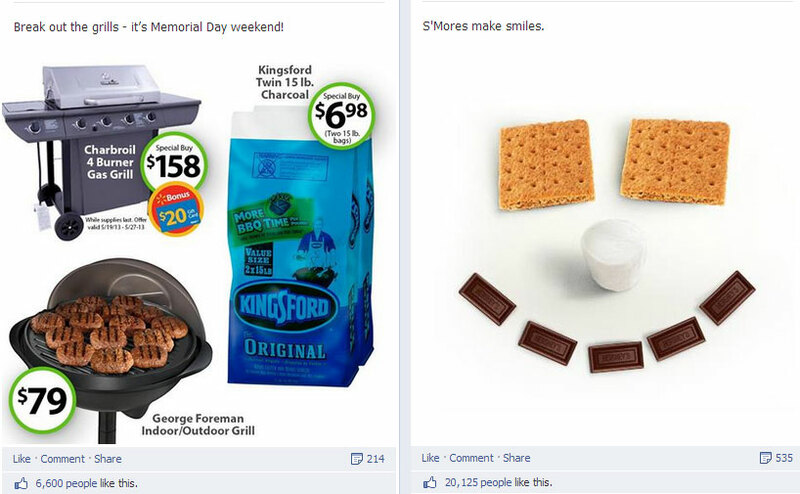 If there’s a trick to how Walmart’s Facebook works, it’s that they don’t overthink it. They post easy to share, funny, feel good stuff, and it works. If you’re already running a Facebook page, loosen up and have some fun with it. Post a picture of your awesome dog. Show us what you grilled over the weekend. Share something funny you found on Youtube.. Don’t just post a picture of every real estate property you list or every toilet you fix, because that gets old. Done right, Facebook is the perfect opportunity to connect with your fans and make a lasting impression that will make them feel good about doing business with you in the long term. Just remember that you don’t have to sell your services in each and every post. If you need help with this, our managed social media and managed blogging services can help. ← Who’s Afraid of the Big Bad Yelp?